As I browsed Evergreen-Rotary Park Tuesday for an upcoming story about the new playground going in, I came upon a memorial I had not found before. 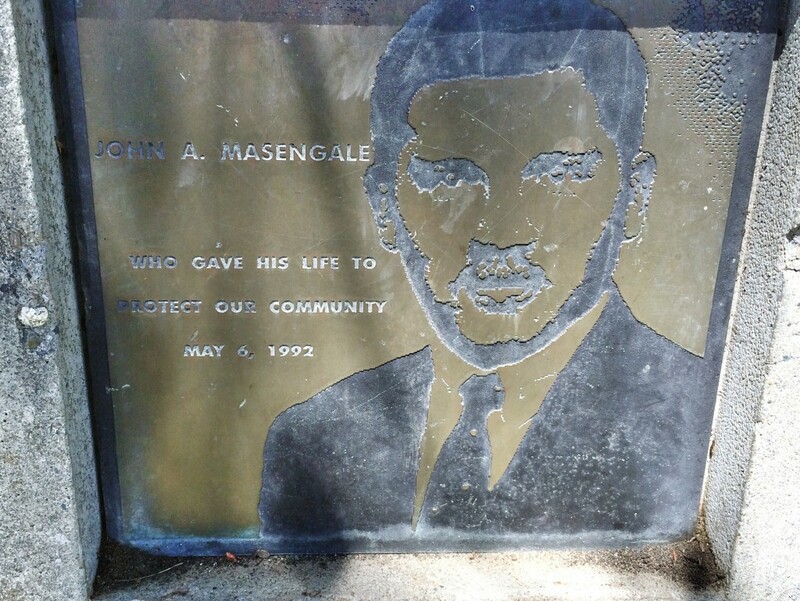 It displayed the face of a man named John Masengale, an ATF special agent killed in the line of duty on May 6, 1992. Bremerton, with its rich Navy history, is full of monuments and memorials. I’ve come to enjoy stumbling upon them. But this particular memorial, near the basketball court, was one I’d heard of before. In my years as the crime and justice reporter, I’d heard about Special Agent Masengale, and the criminal investigation that took his life. Seven law enforcement officers have been killed in the line of duty in Kitsap County history. Masengale, working a clandestine explosives factory case, had helped his fellow agents serve a warrant on a Bremerton home on May 5 , 1992. The next day, while attempting to dispose of about 300 pounds of explosive materials in the Fort Lewis area, some of them ignited and Masengale was badly burned. He succumbed to his injuries. I’d encourage you to go check out the memorial when you get a chance.